Are you starting to get worried that one or more of your customers will never pay your debts to you? Have you encountered a client who has directly told you that he does not intend to pay? Are you bothered by the fact that such non-payments actually have an overall negative effect to the financial aspect of your business? Fret not, for there are ways on how to collect this bad debt. 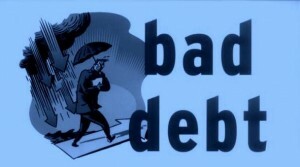 But first, let us define what a bad debt really is. Actually, bad debts must be identified properly, and at the earliest time possible for greater chances of recovering it. Here are common behaviors of customers that are considered to be signs that can possibly lead to bad debts. 1. Your customer fails to pay the amount at the time specified in the payment terms of the contract. 2. He continuously requests for extension every time the payment is due. 3. He makes frequent complaints or negative feedback on the quality of your product or service, particularly at times when you ask about the payments. 4. You cannot contact the customer or his representative whenever you make a call to collect debt. 5. Your telephone calls, correspondences, and electronic mails are unanswered. If you have encountered one or more of these behaviors from your customer, you are most likely to be experiencing a case of bad debts. Apart from being aware of such signs, you must also be on a close look on clients who have the habit of not paying on time. Such a habit might be a cause for the client to become bolder and simply not pay his debt altogether. Unpaid debts can be prevented by constant communication between your company and the client. Written or verbal notices from time to time certainly go a long way in avoiding any debt. Once you have identified a bad debt, you can actually make attempts to recover it through your company. This way, you are still able to maintain a good business relationship with problem clients. At the same time, proper documentation can be created to show that you have made sufficient number of attempts to recover debts. It is an advantage to your company if you have a collection staff that has good knowledge of Fair Debt Collection Practices Act. If your employees possess professional experience in the collection of debt, you have good chances of debt being recovered easily. There are times when in-house efforts are not effective in recovering a debt. If a customer has repeatedly ignored your constant request for payment, then it is time to consult the case to a collection agency. A professional collection agency is equipped to handle cases of delinquent clients in an effective manner. You must likewise remember that once you hire an agency; in effect, it is representing you. Hence, you must only deal with a collection agency that works along the Fair Debt Collection Practices Act. This way, you are assured that it does not use steps that go over legal boundaries. You are consequently saved from any problem with the law. The benefit of employing a collection agency is that you do not need to pay them unless they have actually done their job. Most professional collection agencies only take their fees once they have collected the dues. With you finally assigning the collection of bad debt to a collection agency, you and your staff can now concentrate on your business. As the agency takes the load of debt collection off your shoulder, your full focus is now on the expansion of your company and finding new clients for your business.